Start or interrupt your hop-on hop-off sightseeing tour of Berlin at stop Gendarmenmarkt. The Gendarmenmarkt is one of Berlin's most beautiful squares. 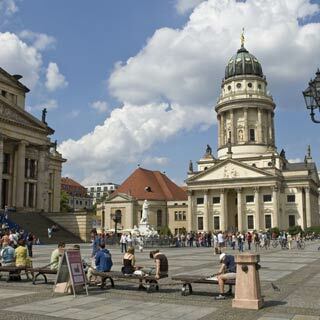 It is dominated by three monumental buildings: Deutscher and Französischer Dom (German and French Cathedral) and Konzerthaus Berlin (Berlin Concert Hall). Hotel Hilton Berlin: Enjoy your stay in the picturesque centre of the city.